Vacation rental house. 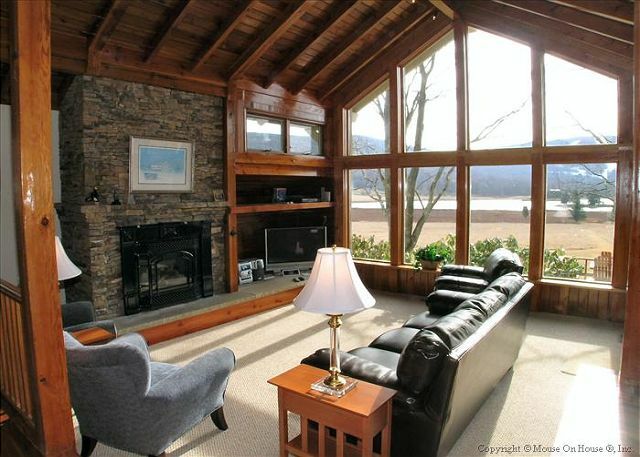 Sleeps 12, 6 bedrooms, 3.5 bathrooms. No pets allowed. Ageless architecture and endless views…welcome to Timeless. 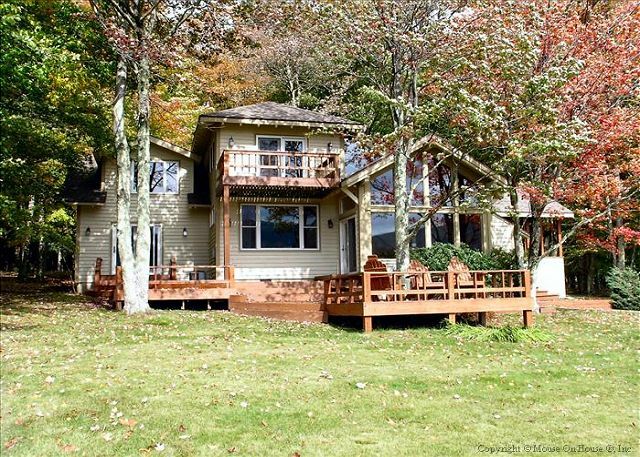 This extraordinary property is situated on five acres of pristine lakefront property. Children of all ages will appreciate that the generous yard provides lots of space for outdoor fun in any season. It is a quick walk to Spruce Island Lake and a sure guarantee that wildlife lovers and photography enthusiasts will be overwhelmed with the abundance of nature. Although it might be tough to talk the gang out of the yard, once inside there is ample space for family style feasts and friendly socializing. Timeless offers six private bedrooms divided between the main house and the “carriage house”, perfect for segregating ages or dividing two families. Both houses offer cable TV and gas fireplaces. 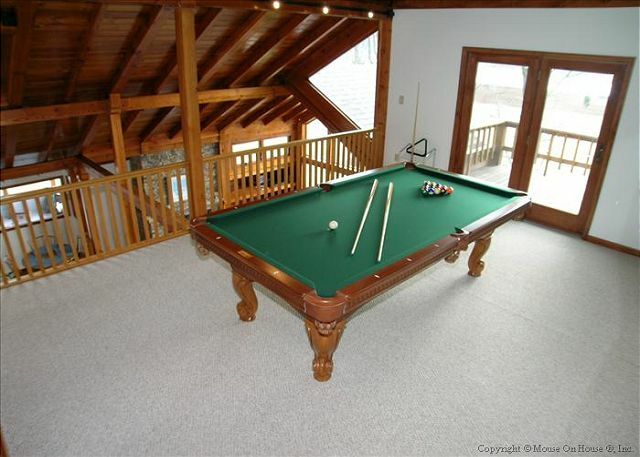 The main house also features a pool table, Jacuzzi tub and WIFI. 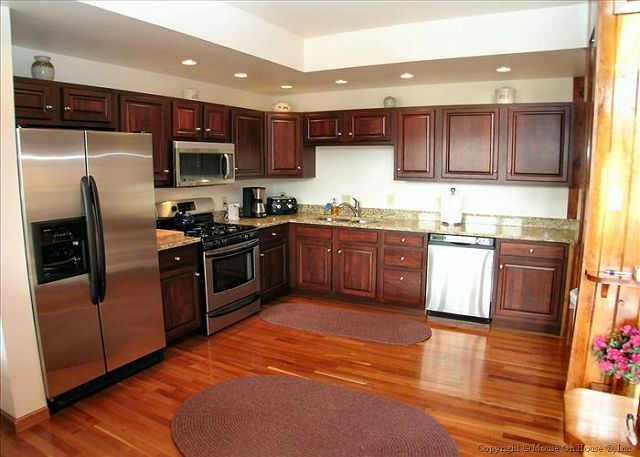 Enjoy the convenience of the fully-equipped kitchen and all the comforts of this one of a kind Canaan Valley home. Beautiful home. Fireplace I living room, fantastic views. Couldn’t have asked for a nicer place to stay. We rented Timeless for our daughter’s wedding. 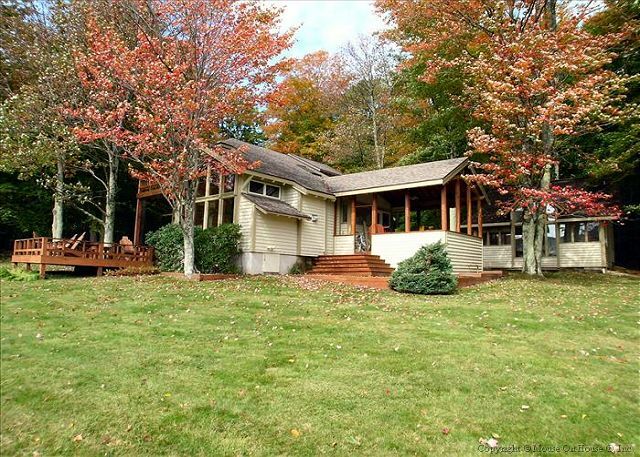 We have owned a vacation home in Timberline for over 20 years. We love this area and so does our extended family. So it was a perfect choice to celebrate this marriage. The house is wonderful to accommodate the wedding party. And setting up the tent with the view of the lake and the mountains was spectacular. 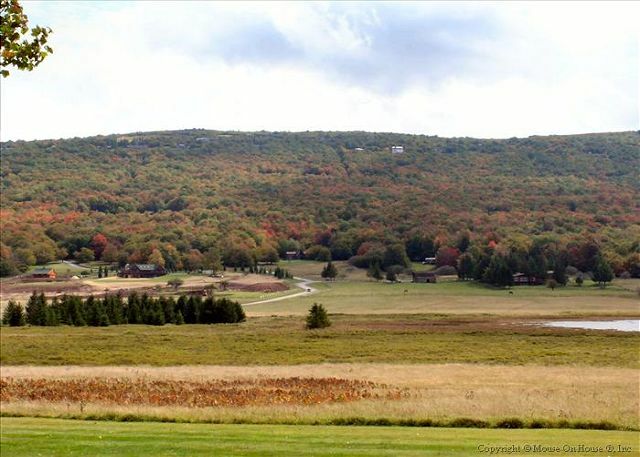 Wonderful vistas, quiet gated community, lots of activities in area, family friendly shops and businesses. We will definitely return. The house was perfect and the kids loved the cottage. We stay here every year in early August and it is just perfect! Donna at the Best of Canaan office is incredible--so very helpful. We love this property and will continue to come. We enjoyed our stay very much. The house is large and comfortable. There are a few things that should be fixed but they were minor. We loved our stay. We had a great time spending the weekend at Timeless. The property management company was wonderful to deal with! We enjoyed hiking the nearby waterfalls and visiting the nearby towns. 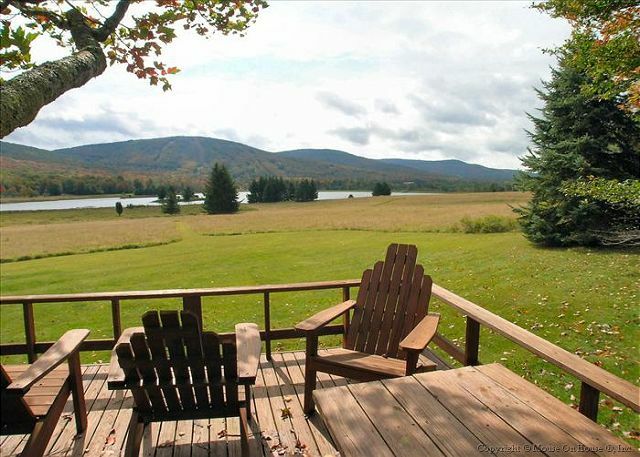 The house has a gorgeous location: right on the conservancy with a fabulous view of the lake and the mountains, in all their Fall glory! The house was very clean and well maintained. Only suggestion: the towels need to be upgraded, as many had frayed and shredded ends. But we all had a wonderful time! It was GREAT!! I have worked with Best of Canaan for several years and they are very accommodating, always friendly and helpful. Since our last time in Timeless, it was repainted outside, and had new carpet placed in bedrooms and guest house which is fantastic. Plan on staying again next year, if not at this location, a larger one. We have large family and we use it for reunions!! This house is a true jewel. So peaceful and the landscape changed with the sunrise and sunset in amazing ways. the Best of Canaan staff was so helpful and pleasant. 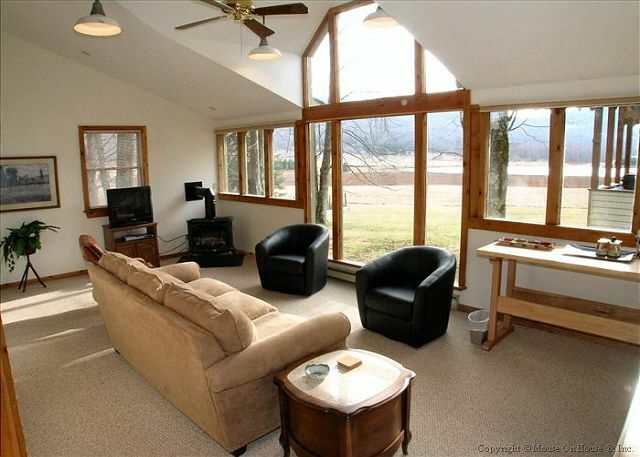 I would recommend this beautiful house to anyone interested in a magical vacation in canaan valley. Great location, house looks just like the pictures and was in great shape. The two separate houses are great for 2 families or a big group of friends. Pool table wasn't in great shape but was still usable. Only bummer was that the grill was out of gas. The unit was clean, but is in need of a pest control treatment, many spiders and a real ant problem in the kitchen. We have been coming to this area for around 20 years now and many of our group are older now and the only negative we heard all week was the regarding the small toilets. That was the only true complaint. Also the big screen TV in the family room needs serviced the color is really bad. Other than these items we were totally pleased with our stay and the service by the management staff was top notch. House is a bit worn. Kitchen cabinet door falling off and dish washer loose. Worse problem was the ants in kitchen.....everywhere. But, Realitor was very nice and helpful, so I'm sure these small problems will be taken care of quickly. Having two separate houses was wonderful. 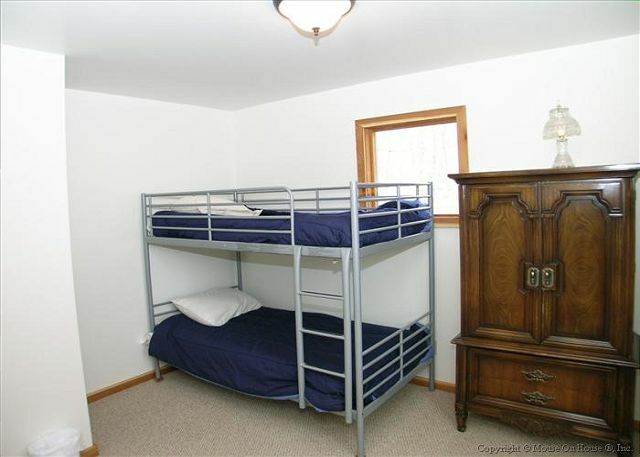 The adult kids could play loud music and video games, and not bother anyone in the main house. And, the view of the valley, mountain side, and lake are fantastic!! This is our third stay in Timeless, and we'll be staying there again. It was very nice, first time to Canaan and will certainly head back. We have a family of 6 with 4 kids and the place was great. The yard was big enough to have a family kickball game in the back yard. Another fantastic trip staying at Timeless. Clean house, with everything we needed. Best of Canaan is a great company to work with! House was an awesome treat. Snow came and went, but the house was perfect for 12 adults. We had a wonderful family weekend!! WE have stayed at Timeless for a number of years in the fall - everything was fine. You do need more keys 2 keys for 8 people. Beautiful view! Peaceful place! Whole family loved it! Will come back! The place was great. The view was amazing, the hot tub was a big hit not only for the adults but the kids loved it too, absolutely beautiful kitchen, and the kids loved having the pool table. Would definitely stay there again!! Been coming here for years. The house has a great layout for large groups and is in good condition. 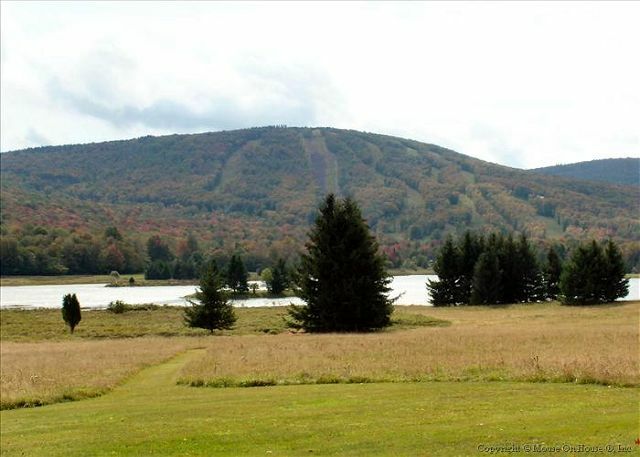 The property and surrounding area are very scenic. And the Best of Canaan staff are helpful and friendly, as always. Throw in some snow and skiing and it's a great trip. 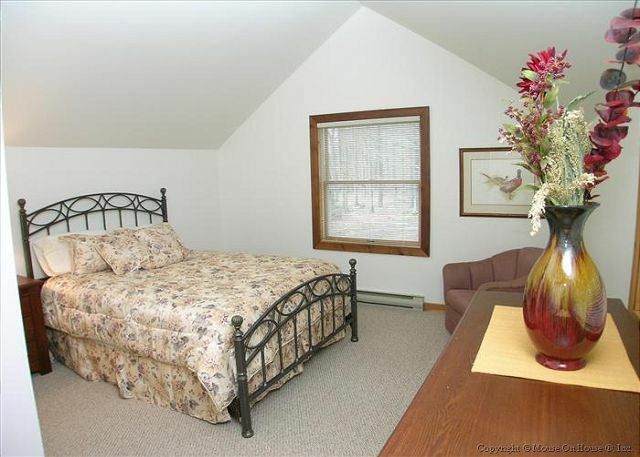 Allover experience is good, close to slopes, great lake view and 2 separate houses on the property, provides you with outstanding stay with family-non-family party, so you can accomodate kids in the separate house and have a party in the other. Cons: outdated house, with old bedding, old kitchen and short supply of towels. I rented this house for members of my daughter's wedding party. It was spacious enough so that everyone had a comfortable space. We enjoyed the time there. 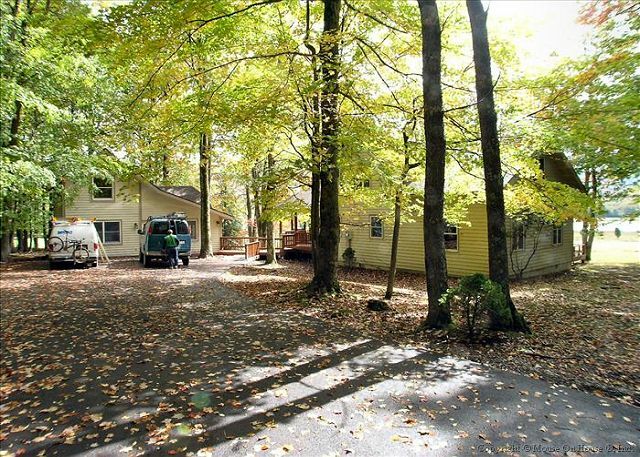 Staff was friendly and accomodating, cabin was in great condition, area was beautiful, no complaints. We had a wonderful time at "Timeless" for our family reunion! We could not have found a better location and rental organization with "Best of Canaan". The ladies at the office were helpful and responsive to our situation and needs, and quick to respond to our questions and urgencies (like promptly having a replacement propane tank when the first one ran out). We are already considering the same unit for next year. We hiked the Dolly Sods with our two-year old in the kiddy back pack, fished in the lake, and visited our family's homesteads. A great time was had by all. Six adult couples enjoyed the rental and area. Good snow conditions for our weekend. We had a great time with our Boy Scout Troop of 4 adults and 8 scouts. The place was clean, warm and in great shape. Everything we needed in the Kitchen was available. Can't wait to come back next year. Friendly and helpful staff, along with a great property, made for a wonderful trip. Thanks to Amy and her team. This was the first time we stayed in Timeless and it was great. We had 10 friends with a mix of couples and the space was perfect. Both the main house and the 2nd house were clean and had everything you needed. 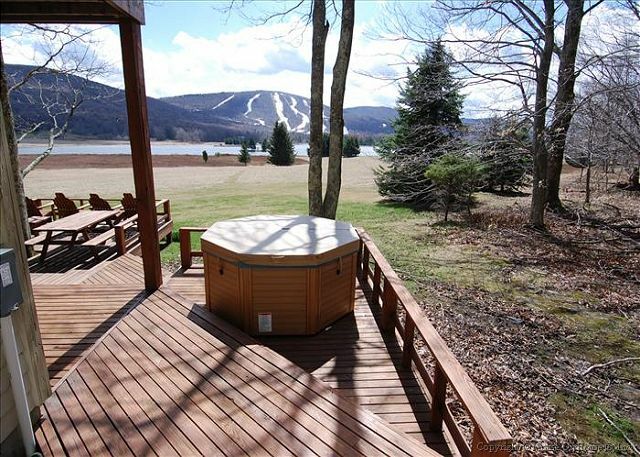 The outside of the place could use a bit of tlc, the hot tub isn't large enough for the amount of people that can be in the house, and it could use a few upgrades here and there...but overall its a great place with an awesome view of the valley and Timberline. I stayed at the Timeless with a large group of friends in October. Our primary purpose was hiking and hanging out and the property really was great. 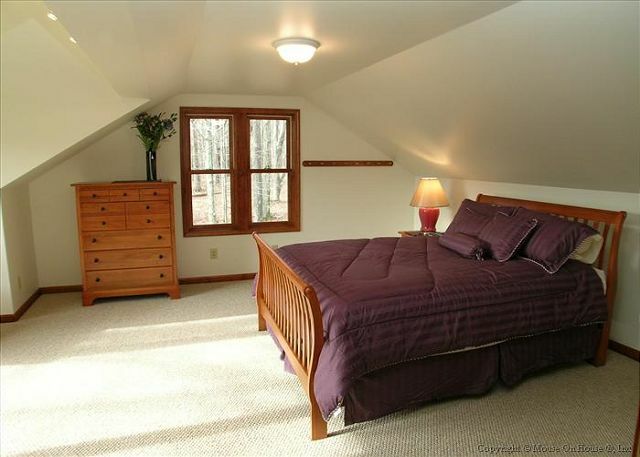 - Overall layout of the house, including the loft in the main house and the separate carriage house is ideal. - Fridge seems a bit small for a 6 bedroom house. Overall, we were very pleased with the experience! I have stayed at Timeless many times. It is always clean and well maintained. The weather was perfect and the leaves were at their peak. Sirriani's is always our first stop. Best food around! Fun hike to the top of Cabin Mountain. Lots of deer this year. I already plan to book Timeless for our next fall trip! it worked perfectly and the staff was awesome to work with. The view and setting of the home was wonderful. Waking up to the lake and mountains was awesome. Having a yard for the kids to play in was a huge plus. 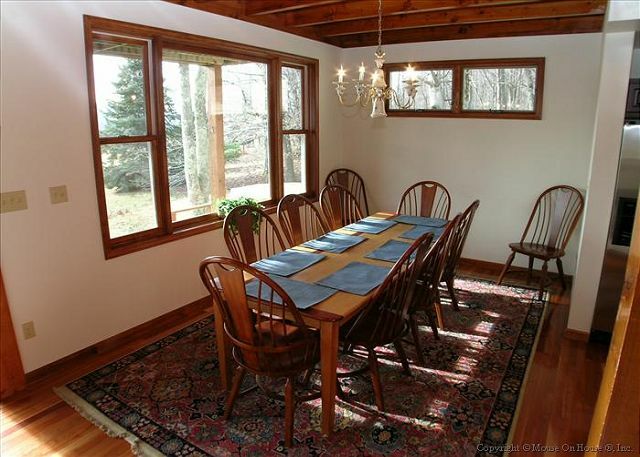 The big house has a great room/dining/kitchen area that is very functional for a crowd. 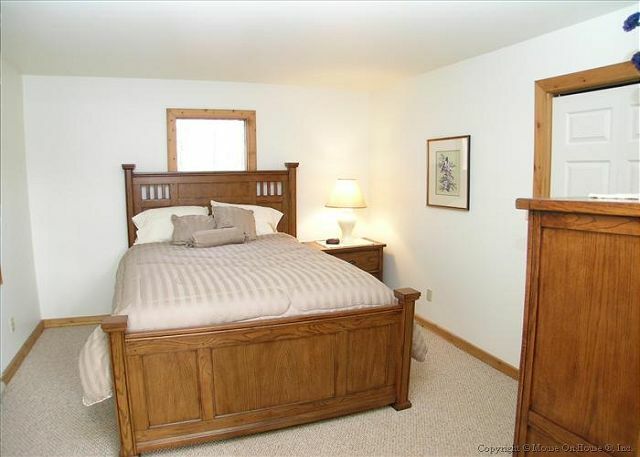 Well built as we did not hear all the commotion from downstairs when we were in the upstairs master bedroom. Repair needed for cold water knob in master bath (couldn't get any cold water for the bath), there was no gas in gas grill which was a big disappointment when we went to cook the chicken, the blinds had been lightly cleaned and were fairly dirty. The carriage house was a huge disappointment. Windows were filthy facing the lake view, mattresses very uncomfortable, musty and dirty smelling, squirrels in the roof, furniture very old in sitting area, television is an old 19" set. I would not rent this location if you need to use the carriage house. But the big house is a good bet. I would strongly recommend an outside power washing for both buildings as the spider webs and bugs gave them a run-down feel. My daughter left a fair amount of clothes in the carriage house and the staff at the rental agency are happy to mail them to her. Their motto, "Where nice matters" is true. Staff very easy to deal with. Overall, we had a very good time. Our family had a fantastic time & will return. We loved the open living area, plenty of bedrooms, view, things to do in area, & especially the hot tub & pool table. The sunken living room & extra step up to the entry/foyer was unexpected & ok for our nearly 3 & 5 yr old grandchildren---but should be warned for children 8 mos-2 yrs. Mapquest & GPS weren't accurate for rental agency or cabin,& cell phones didn't work--so our children had difficulty finding the place. Recommend using instructions & landmarks provided by rental agency. 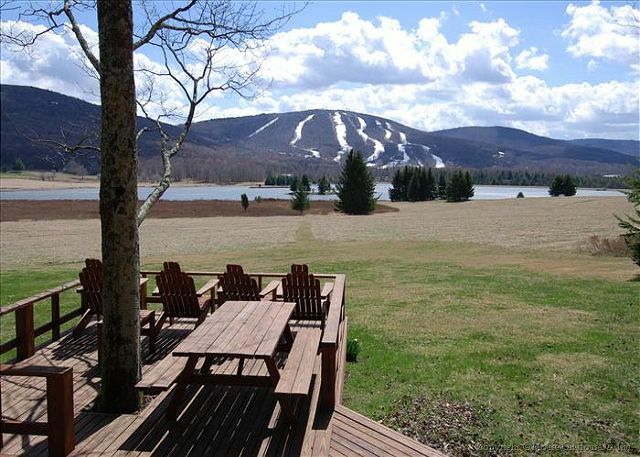 Skiing in Caanan - A great house to stay. 2) Some kind of animal was livinig in the walls of the guest house. I reported it to the rental company. This is certainly expected in the wilds of WV and hopefully the owner will address it promptly. But, we had a great time with plenty of room. I would definitely stay int the house again. The view of the foilage from Timeless was amazing! Plenty or deer, even saw a Bald Eagle flying the valley! We have stayed at Timeless before and will again in the future. Absolutely perfect weekend at Timeless for Leaf Peepers. 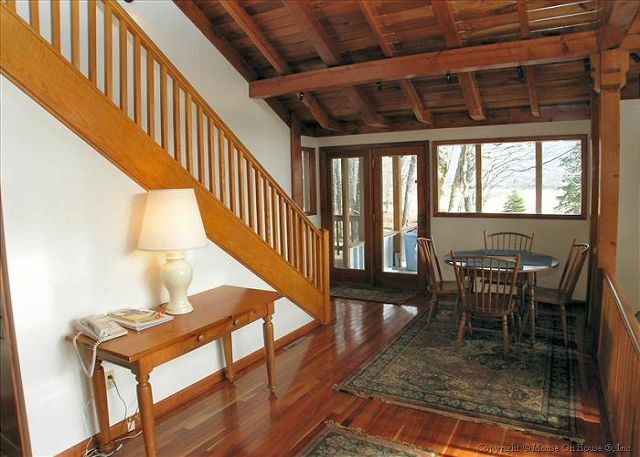 Furniture is showing some wear and tear but location of house is absolutely wonderful! Staff at Best of Canaan are awesome to work with. We will be using them again without a doubt! Timeless worked out well for our 3 family get together. It was very private which was what we wanted. Lovely view of the pond. Having the two houses allowed the younger adults to stay up as late as they wanted with out keeping the older adults up. We loved the hot tub, the fishing and the pool table. The kitchen was fairly well stocked but none of the can openers worked. The management company brought one out to the house. We should have told them to bring out light bulbs too. There were more than a few burnt out ones. Also, the place needs a bigger fridge or a second one. We had 12 people there and lots of food. Good thing it was pretty chilly the weekend we were there. We just used the porch to store the extra soda and beer. Our quilting guild group of 13 had a marvelous time sewing, cooking and dining in the well equipped and spacious house. I loved the guest house and the view from both houses was fantastic. and several of the overhead lightbulbs were burned out and we could have used them all to be working. I also looked for salt to help melt the snow and ice on the walkways, but could not find any. It would have been nice to have had that provided. Best of Canaan has great people and is very nice to work with. We have stayed at Timeless for at least 15 years on and off. The view is the best! The property is beginning to show some wear, but still a wonderful place to stay! Beautiful house and an easy reservation! We really enjoyed staying at Timeless and would consider renting it again. However, when we arrived the property had lots of bugs and spider webs scattered throughout the two houses. We had to run the vacuum everywhere. 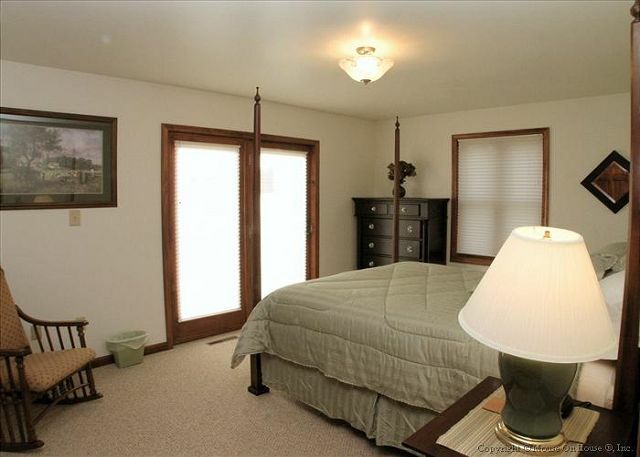 Overall, the main house is wonderful - very beautiful and comfortable. The only complaint with the main house is the water pressure in the shower on the second floor is weak. The carriage house does not have air conditioning and we had a couple of very hot days. Sleeping at night with the windows open was not enough to keep us comfortable. 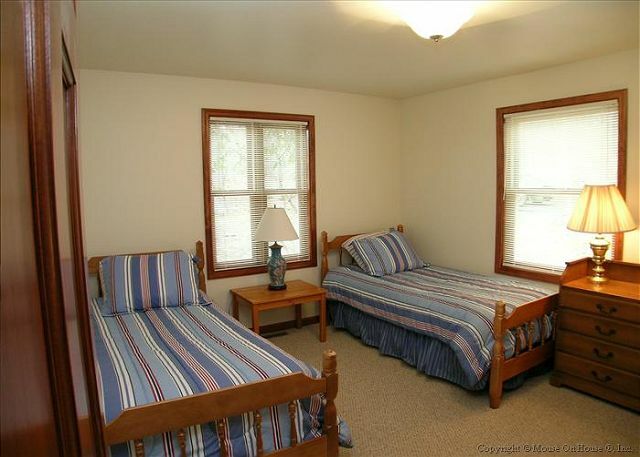 It would be very helpful if the owner would install ceiling fans in the two queen bedrooms. Access to the lake is very convenient and the view is awesome! It's very relaxing sitting on the deck taking in the sites. The yard was great for playing outdoor games like bocce ball and those of us that used the hot tub found it very relaxing.